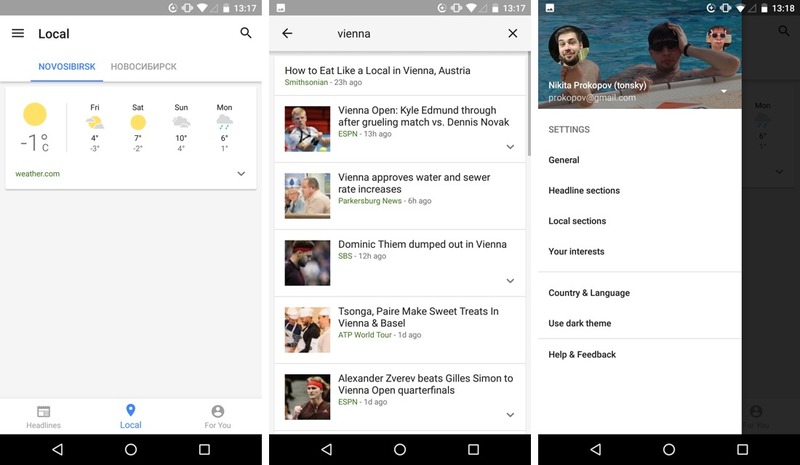 nikitonsky: does anyone know how Google came up with the idea to fusion weather and news into the same app? As a result, it’s impossible to use it to actually learn what the weather is like. Granted, it opens up on the weather screen first, but it’s the weather at some random location. In the case above, I was travelling in Vienna, lived in Moscow before that, and it showed me the weather in Novosibirsk (twice). So I used search, right? And it fulfilled that: it showed me the Vienna news, apparently. Whatever alien logic it is, I went to settings, only to find that city selection is neither in General nor in Country & Language. It is possible to specify a city, but you have to go to “Local sections” and configure weather and news at the same time. I know Google is very proud of their Search business, but is searching for weather report too much to ask?